Different versions of CAD steelwork solutions exist since many years. Some are already designed as independent solutions while others are presented as additional modules for standard CAD systems. 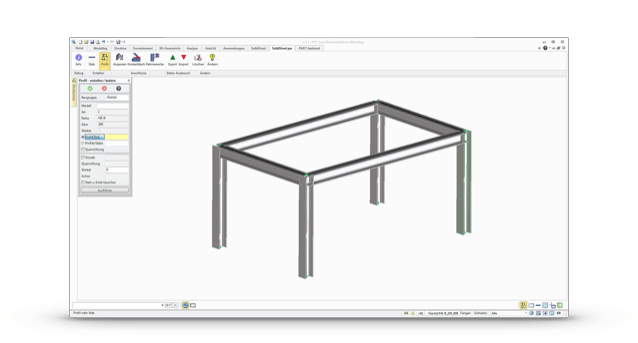 SolidSteel parametric also is an additional module or app for standard CAD systems. In contrast to many other solutions, it convinces with the possibility to be used in various CAD systems. That makes the difference! SolidSteel parametric for Modeling is the 3D CAD steelwork solution for PTC Creo Elements/Direct Modeling. As you may expect already by its name, SolidSteel parametric is a parametric steelwork system. This means that – after changes are made subsequently – the whole construction will be adjusted to new circumstances. For example, if a column is put to a new position, the related components of this column are adjusted by the software. They are extended, shortened or twisted as needed. If it's necessary, even the angles of inclination of related beams will be changed. Those automatic changes run through the whole construction and also includes all the ports. Even the complex ports as frame corners with coves, head plates or ribs are adjusted automatically to a new and changed situation. The base of SolidSteel parametric consists of system lines which are used as reference axes for the profiles afterwards. 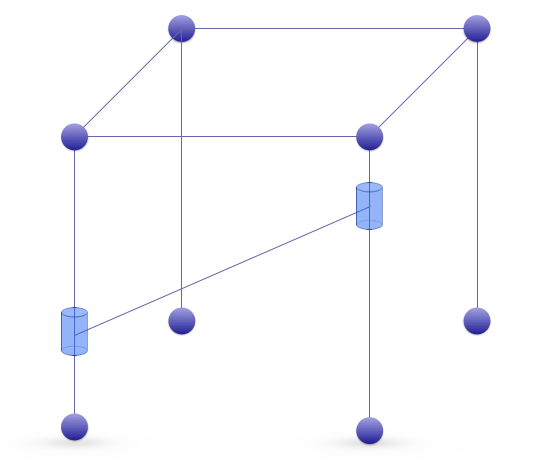 The system lines are connected to each other by intelligent connection points. They can be moved in space or along another system line. The trick is: The steelwork parametric is organized within SolidSteel parametric only. No special modeling components are necessary. The independent steelwork parametric enables to run SolidSteel parametric fast and performant. It's your best advantage! Furthermore, the steelwork data exchange with other SolidSteel parametric versions is possible without any problem. You can realize complex steel constructions with the program package SolidSteel parametric - Framework. With a few clicks, you create a framework of system lines, connected by intelligent connection points. Profiles are linked to the created system lines. You can choose the relative position to the system line. SolidSteel parametric – Framework already includes the profile library SolidSteel Library. Simple editing options are included in the Framework, too. Those options enable to cut the profiles at each other. They can be adjusted or cutted. All information about the connections of the steelwork components are saved in the Framework. If the steel construction is changed, the app changes all the connected components automatically. 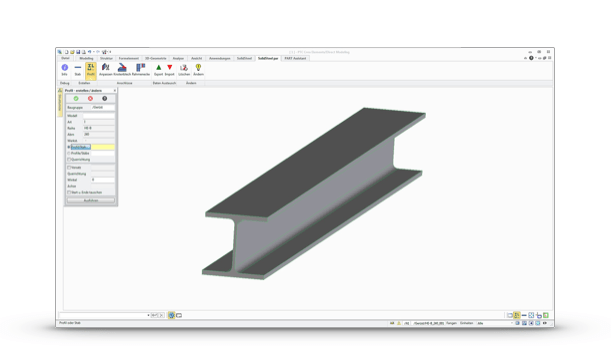 SolidSteel parametric – Framework also enables the import and export functions. With their help, you can import or export the whole steelwork construction, including the steelwork intelligence. The data exchange will be lossless. The chosen construction can be edited seamlessly after the import, even in other CAD systems. The profile library is included in the scope of supply of the program Framework already. It's the library which is included in the programs SolidSteel and PART Assistant, too. If required, you can buy the profile library as the PART Assistant independent from SolidSteel. You can use it on workplaces without SolidSteel. To create a simple steel profile, you only have to choose the profile row and the size as well as the length and direction. Afterwards, the profile can simply be placed in the construction. The profile library can be extended by any number as well as by any form of profile rows. SolidSteel parametric for modeling is built modularly. You can choose which functions you need. For some workplaces, only some profiles are required by occasion. Here, the PART Assistant without Framework and without the steelwork parametric is sufficient. For some customers, the steel construction with all profiles in their right position is important. They search for clearly cutted constructions without overlapping, as well as without ports and further processing of steelwork data. Those customers can choose Framework as a complete steelwork construction system without any restrictions. However, other customers need the complete steelwork from A to Z, including the Framework and the typical steelwork port detailing until the creation of NC data. You can choose your favorite version!